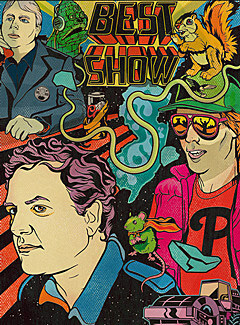 As mentioned, Tom Scharpling‘s much loved, much missed The Best Show makes its return tonight (12/16) in live podcast form with the whole gang (Mike, Gary, Roy, Vance) in tow. Listen (and call in) live tonight from 9 PM – midnight. It will be available as a podcast as well through iTunes, etc. You can also relive some (ok, a whole lot) of Tom and comedy partner Jon Wurster‘s finest bits from The Best Show’s WFMU years on the 16-disc The Best of the Best Show box set which will be out in March via the Numero Group. I kept my head down and didn’t go out a whole lot so my list might not be as diverse as it would have been in past years. (Sorry, 4:35 PM!). These were some of the things I loved this year that I remembered before other things. King Crimson at Best Buy Theatre 9/18 – The three drummers were amazing and the song selection was perfect. I haven’t been this into King Crimson since I was 14. EAGLEHEART Season Three (Adult Swim) – A show that began as a Chuck Norris parody ended with an epic full-length movie capped off with a glorious Bob Fosse tribute. Someday this show will be appreciated as it should be. New Pornographers at Brill Building 9/4 – A triumphant show marking the release of BRILL BRUISERS (Matador), the most joyous NPs album since TWIN CINEMA. 13th Floor Elevators LIVE EVOLUTION LOST (International Artists) – A rocking and messy show from 1967, right before the wheels came off. NATHAN FOR YOU Season Two (Comedy Central) – The second season topped the nearly-perfect first season. I cannot wait for the third! INHERENT VICE – Better than the book, a consistently beautiful bummer. And Paul Thomas Anderson let Martin Short be Martin Short! The Feelies at Asbury Lanes 12/5 – the pride of New Jersey, still as mammoth as ever. Their rendition of “Slipping (Into Something)” broke down into an extended squall that still has my ears ringing. Fucked Up GLASS BOYS LP (Matador) – It’s a thankless task to follow up a two-LP concept album, but Fucked Up really rose to the challenge. Lean and rocking and slightly weird, and it will make sense after the next album comes out. The Nots/Spray Paint/Protomartyr at GonerFest, Memphis, 9/27 – Three bands that stole the show at GonerFest 11. All three also put out amazing albums this year as well – Spray Paint’s CLEAN BLOOD, REGULAR ACID (Monofonus), Protomartyr’s UNDER COLOR OF OFFICIAL RIGHT (Hardly Art) and the Nots’ WE ARE NOTS (Goner). Thee Oh Sees DROP (Castle Face) – Another amazing Thee Oh Sees LP. This one boils down all their elements into one perfect place. They threatened to go away and suddenly people stopped taking them for granted. Don’t let it happen again!